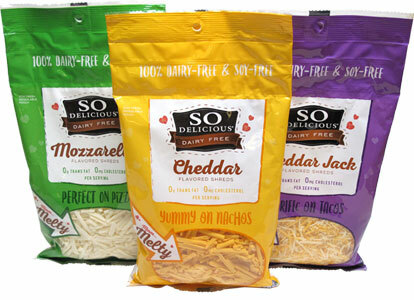 Introducing So Delicious Dairy Free Cheese Shreds! Free from dairy and soy and Non-GMO Project Verified—they're the perfect match for your grilled sandwiches, pizzas, nachos, tacos, and more. Anywhere you'd normally use shredded cheese, you can use these options as the perfect replacement as they melt and blend perfectly in all your favorite meals. Choose from Mozzarella, Cheddar, and Cheddar Jack and change the way you make lunch, dinner, and snacks. Living dairy-free has never tasted so good! 8 oz. (227g) packages are $5.99 each. From Patti S of St Paul, Minnesota on 1/10/2018 . This is the best Cheese Alternative I have ever had. Closest to real that you can get! I just wish it was available in more stores. The only store I can find it in is Whole Foods, Please start offering at more stores such as Walmart or Target. From Hyde of Boonies , Vermont on 11/24/2017 .